Extensively refurbished by the current owners this impressive detached family home now offers a luxurious lifestyle to the discerning purchaser. 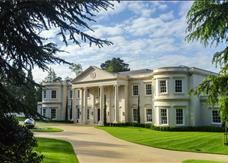 Over 7,800 sqft of accommodation located in one of the country's most desirable private estates. Located in one of the country's most desirable private estates, yet less than 0.3 of a mile of the station, local shops and restaurants. Over 5,000 sq ft of accommodation and with a plot of almost an acre, backing south. Located in one of the country's most desirable private estates, yet less than 0.3 of a mile of the station, local shops and restaurants. Over 5,000 sq ft of accommodation and with a plot of almost half an acre, backing south. A delightful, raised ground floor apartment, with the two reception rooms formed from the original and elegant 19th Century ballroom, overlooking beautiful park-like communal gardens as well as also benefitting from an attractive private garden. A deceptively spacious family home located in a popular residential road in Virginia Water. The property offers flexible accommodation with over 2,000 sqft with a detached double garage and gardens approaching 0.2 acres. A modern two double bedroom apartment situated within the highly regarded Virginia Park development in Virginia Water. The property benefits from allocated parking, 24hr security and use of leisure facilities.